Are you my hometown, Santa Paolina? I thought it was all coming together. 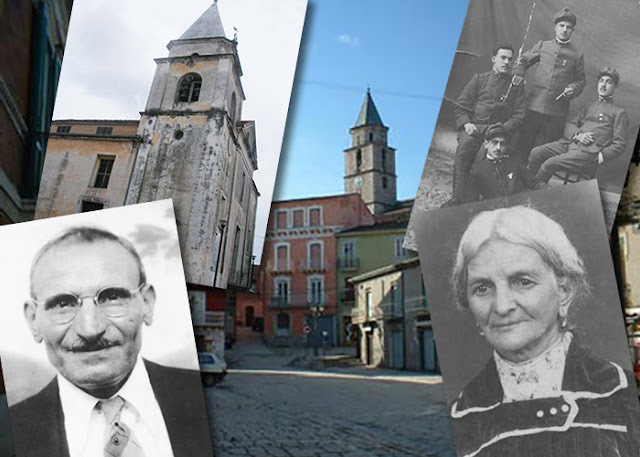 I thought I'd have some answers about my great great grandparents, Antonio Saviano and Colomba Consolazio. But sometimes your ancestors are not where you absolutely expected to find them. Follow me for a moment on this genealogical path. Recently I charted out exactly which of my direct-line ancestors I've identified. I color-coded them to show the direct ancestors of each of my four grandparents. My progress was incredibly satisfying, but it held a startling truth. The branch whose descendants I grew up with—my maternal grandmother's branch—is the one where I've made the least progress. I know my great grandparents, Giovanni and Maria Rosa, and each of their parents' names. But I'm troubled by the lack of progress with Maria Rosa's parents, Antonio and Colomba. They each died in New York City. I've seen their death certificates at the New York City Municipal Archives. Their parents' names were hard to read, and the source of the names was someone who never met these people. From my earliest days in this genealogy hobby I had conflicting information about where Antonio and Colomba came from. My 96-year-old great aunt (their granddaughter) was still as sharp as a tack when she told me they were from Avellino. It was a simple fact she'd heard from her mother Maria Rosa time and time again. OK, but Avellino is a city and a province. So where were they from? 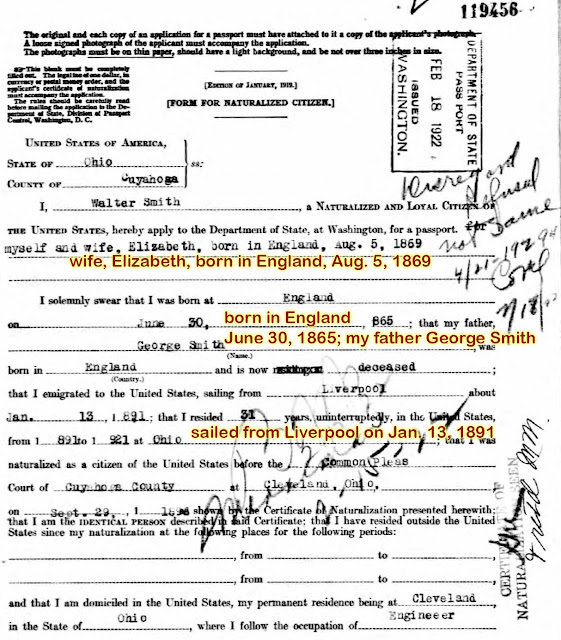 Then I found the family's 1898 ship manifest when they sailed from Naples to New York, and it said something else. It said they were from Sant'Angelo a Cupolo. 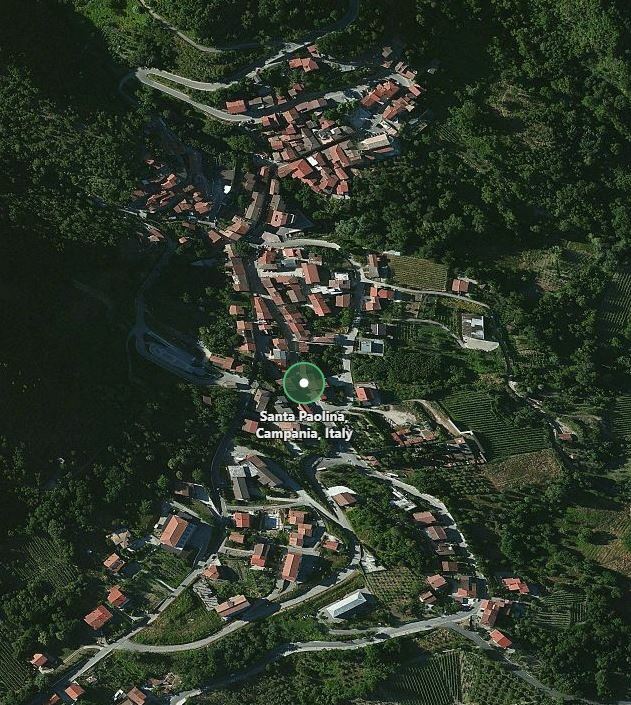 That's in the Benevento province, bordering Avellino. Their New York City marriage records say that Antonio and Colomba's daughters were born in Sant'Angelo a Cupolo. That places the family in Benevento, not Avellino. 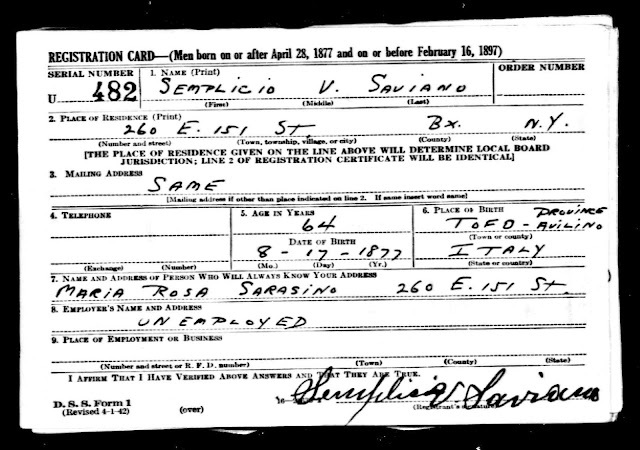 Then I found a World War II draft registration card for Antonio and Colomba's eldest son, Semplicio. He was born in Tufo. Woo hoo! Tufo is in Avellino! I ordered microfilm of Tufo birth, marriage and death records from FamilySearch.org and found Semplicio's 1877 birth record. Surprisingly, I also found an 1875 birth record for another son named Raffaele. There was a younger Raffaele, so this son must have died as a child. I don't think my great aunt knew about him. Antonio was already 33 when the first Raffaele was born. Based on my extensive research of this area at the time, I believe there must have been previous children. But the Tufo records had nothing else. No other children of Antonio and Colomba were born in Tufo, and they were not married in Tufo. Luckily, Colomba has an uncommon maiden name of Consolazio. 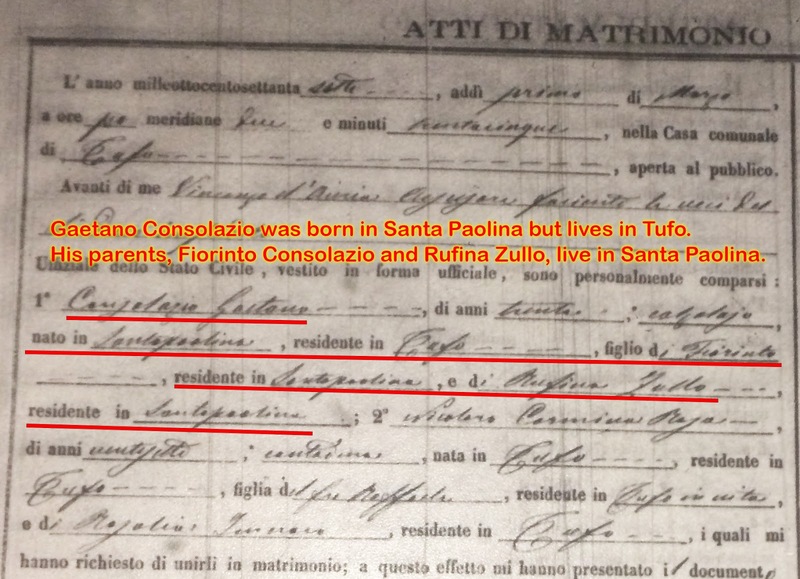 I scoured the Tufo records and found two men, Gaetano Consolazio and Sabato Consolazio, whose children were born in Tufo around the same time as my Raffaele and Semplicio. My great great grandmother's brother provided the missing link. Gaetano Consolazio's marriage document seems to hold the key to unlock this entire family's background. 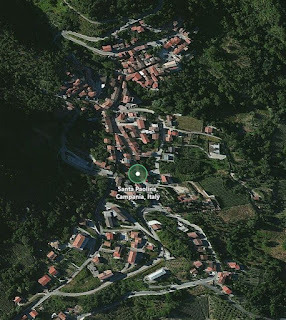 He was married in Tufo, but he was born in Santa Paolina—only three miles from Tufo! His marriage record also confirms his and Colomba's parents' names, which were absolutely wrong on her 1920 death record. In 1877, the document says, 60-year-old Fiorinto Consolazio and his wife Rufina Zullo were living in Santa Paolina, Avellino. Colomba's brother Gaetano was born in Santa Paolina. Their parents lived in Santa Paolina. That gives me a strong reason to believe Colomba was born there. She probably married Antonio there. She may have had an earlier child there. Antonio and his siblings may have been born there, too. I've ordered the Santa Paolina microfilm. This was my last chance to order film as the Family History Center microfilm program ends on August 31, 2017. And there's no guarantee these records will ever be digitized and put online. So now I wait. Fingers crossed, I may soon be adding several more ancestors to my chart and datapoints to my family tree. Oh boy, I hope they're there! 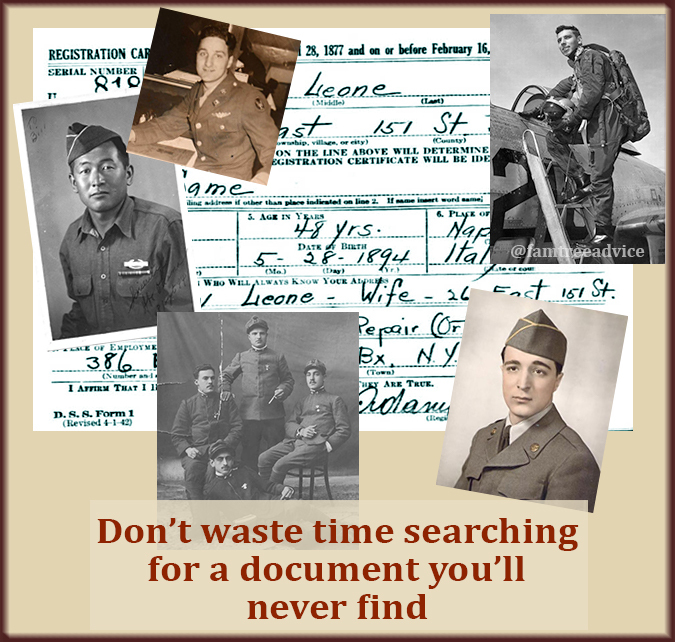 Don't waste time searching for an ancestor in a document collection that will not contain their name. Genealogy is a thriving industry overflowing with documents and databases. 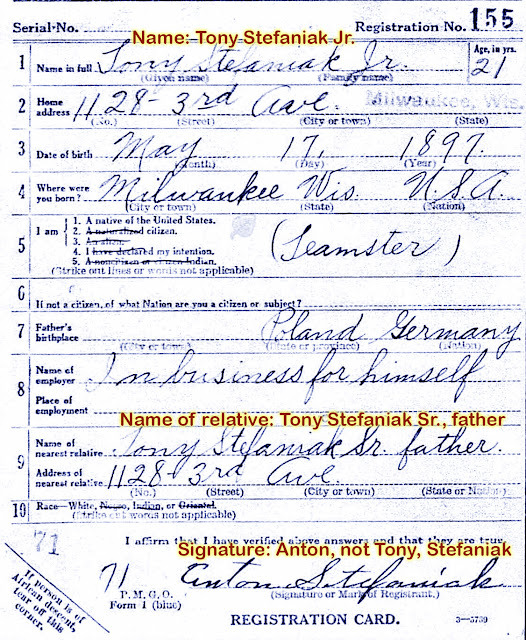 If you subscribe to any ancestry sites, you've got a never-ending supply of databases to browse. But don't waste time. Learn exactly what a document collection holds before you start your search. These men in my tree had military records for me to find. But not my paternal grandfather. Here's a prime example of how I've been wasting time hunting for a document that can't even exist. My maternal grandfather, Adamo Leone, fought in World War I. He was in the Italian army and became a prisoner of war. Obviously I'm not going to find a United States World War I draft registration card for him. 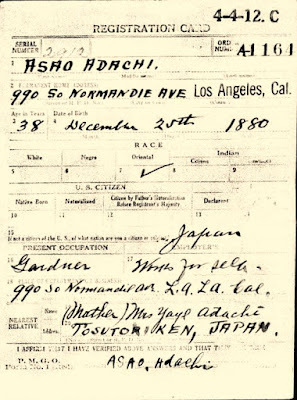 I do have a copy of his World War II registration card when he was 51 years old. This is called the "Old Man's Draft" and was more a database of skills than prospective soldiers. These men were never intended to go to war. My paternal grandfather, Pietro Iamarino, was still living in Italy between 1914 and 1918. He was only 16 when World War I ended. But I had no World War II record for him. 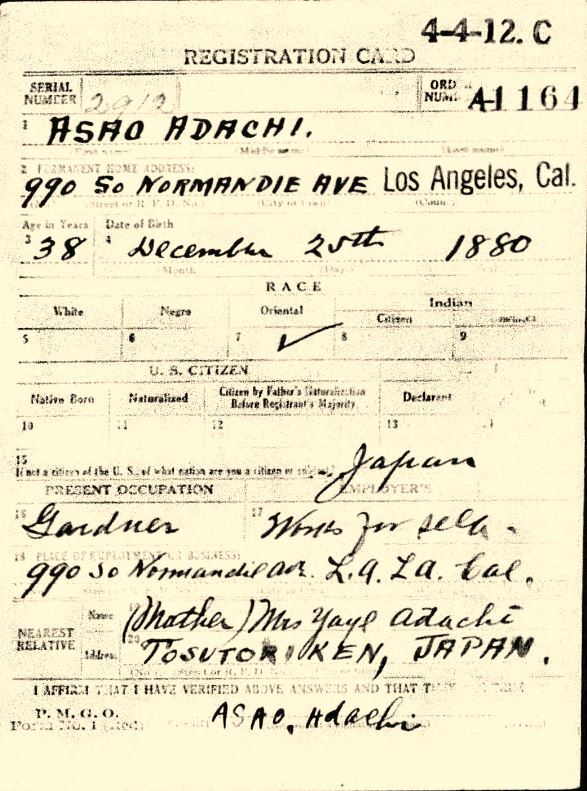 I spent a lot time examining images of registration cards, one by one. I figured the name "Iamarino" was misfiled, so I hoped to find it myself. Then one day it struck me. Maybe his 1902 birth year excluded him from this set of records. Here's what I should have researched in the first place. Men who were drafted for World War II were age 18–35 in 1942. If they were between 35 and 45 and unmarried, they were also eligible for the draft. Grandpa was 40 years old and married in 1942. He was beyond the cut-off for military service. 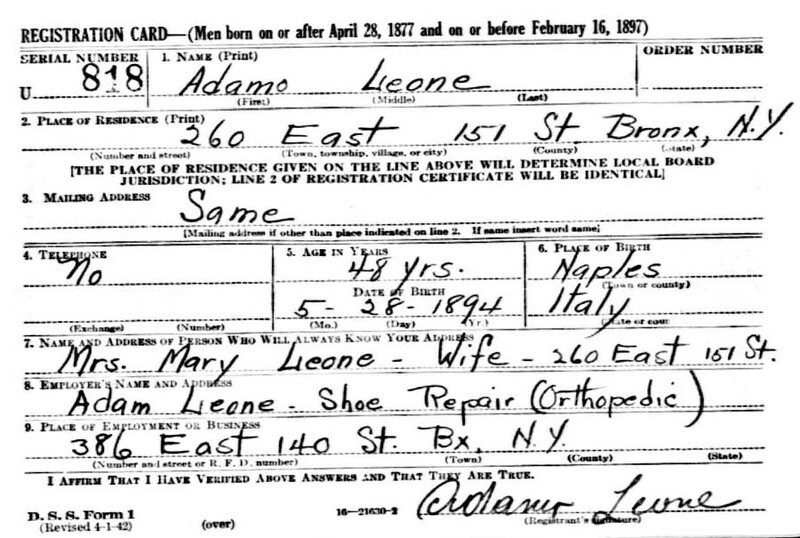 Then there was the "Old Man's Draft" where I found my other, older grandfather Adamo. This registration included men born between April 27, 1877 and February 16, 1897. Grandpa, born in October 1902, didn't fall into this category, either. As an able-bodied 40-year-old man, Grandpa Pietro was left to continue his work and take care of the home front. This tiny bit of research could have saved me lots of time. So here's the moral of my story. Before you search for a particular ancestor in a document collection, stop. Find out exactly what that collection contains. Decide if your ancestor should be there or not. On ancestry.com, each collection has its details listed below the search area. On familysearch.org, the descriptions are above the search area. Find out what you're looking at before you spend hours looking at it. I can put an "n/a" in the draft card field of my document tracker spreadsheet for Grandpa.